When I first bought my Instant Pot, I mostly used it for meal prep staples, such as preparing quinoa, black beans, and perfect steel cut oats. However, as I’ve been testing more recipes with it (for my upcoming Instant Pot cookbook!) I’ve been having a lot of fun branching out to see what else is possible. As it turns out, you can make a LOT of different things in the Instant Pot. 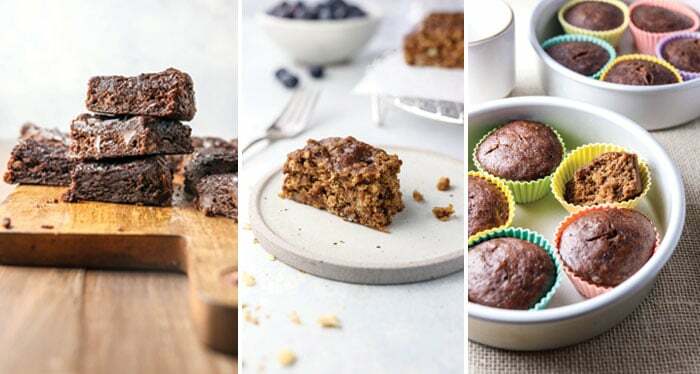 I’ve successfully made salmon and hard boiled eggs, but in order to make recipes like brownies, cakes, and muffins, you’ll need a few more accessories. You may already have a few of these items for your basic stove top and oven needs! Today, I thought I’d share my favorite accessories in case you want to be well-equipped to make any Instant Pot recipe your heart desires. One of my favorite perks of the Instant Pot is its ability to cook two things at once. For example, I now make my Kung Pao Chickpeas recipe with a bowl of rice at the same time(! 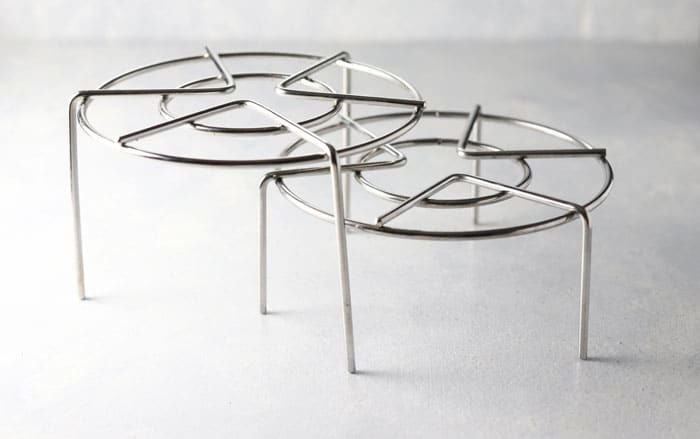 ), in the same pot, using the shorter one of these trivets to boost an oven-safe bowl of rice above the chickpea mixture at the bottom of the pot. 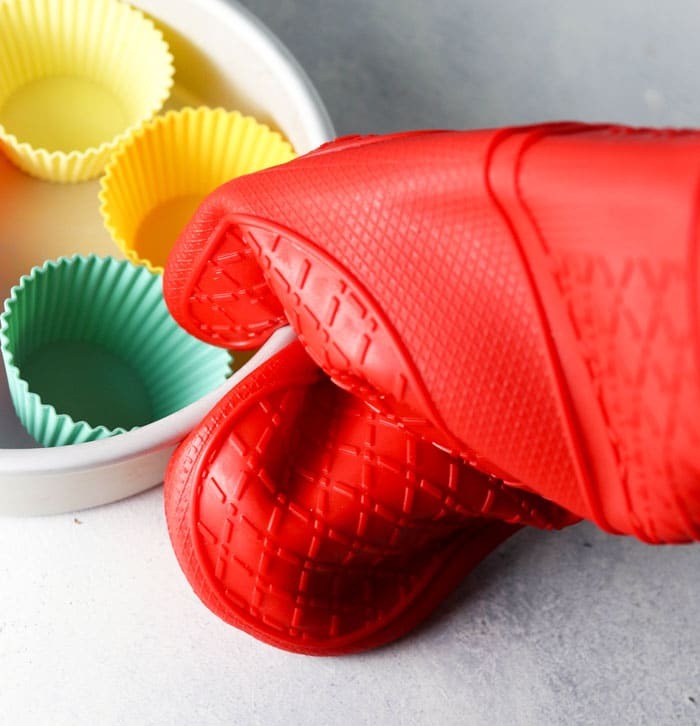 I’ve been using these silicone muffin liners for years, because they are my favorite for stick-prevention when making coconut flour muffins (which tend to be very sticky to muffin liners!). 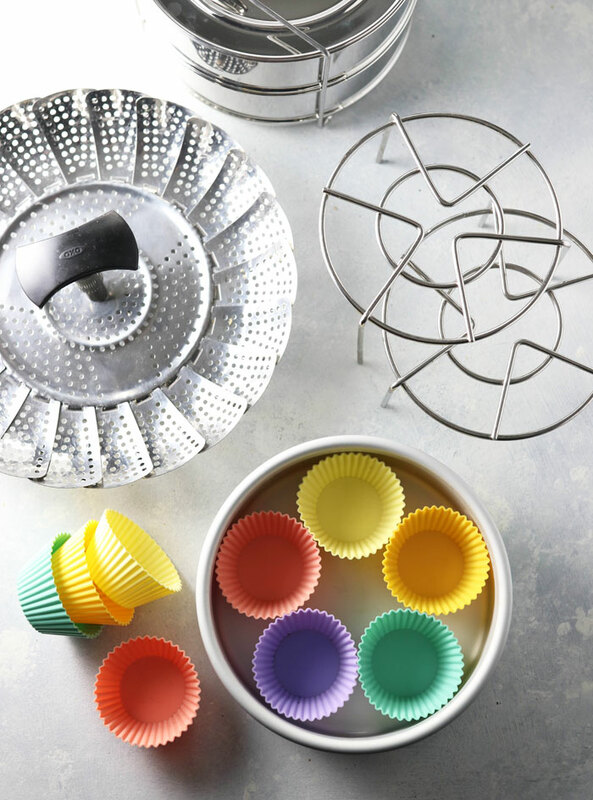 These sturdy muffin cups are perfect for making muffins or cupcakes in the Instant Pot, because they hold their shape without using an actual muffin pan. I just arrange them in my 7-inch cake pan as shown the photo above. You can actually squeeze 6 of these liners into a 7-inch pan at one time, but the muffins will be slightly squished looking and they tend to hold their shape. So I only use 5 liners per pan if I want them to look pretty for presentation. If you use regular parchment paper baking cups, your muffin batter will spread as it cooks in the Instant Pot, and you’ll wind up with triangle scone shapes, rather than muffins. Still cute and edible, just not quite muffin shaped. Instant Pot Stackable Insert. UPDATE: After using this stackable insert for several different recipes, I’m not a fan. It seems to displace water and allow the steam to go into the pans, so it’s not ideal for baking a cake or muffins, and it will create condensation in your recipes. I prefer using two 7-inch pans stacked on top of each other instead. 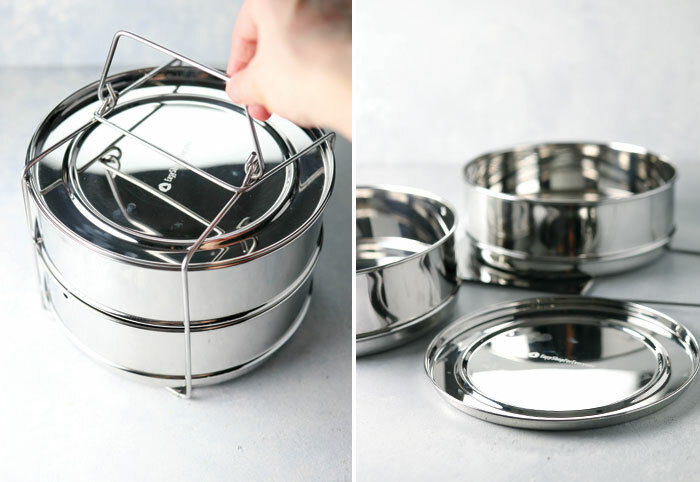 They make specialty steamer baskets for the Instant Pot (I first bought this one), but I love this Oxo Steamer with an extendable handle so that you can use it in your electric pressure cooker, or simply in a pot over the stove. This is another accessory that you might already have in your kitchen. If you don’t, you’re missing out, because these are the BEST oven mitts ever! I love that they are made of silicone, which helps protect your hands from hot moisture while also giving you a secure grip on your pans. Need some healthy Instant Pot recipes? Be sure to pre-order my new cookbook, The Fresh & Healthy Instant Pot Cookbook. You can see a sneak peek here! Note: The only accessories needed for my cookbook are a 7-inch pan (which can double as a bowl for cooking rice) and the trivet set. I use the 2.4-inch trivet most often, but the 4-inch option is nice when you want to have more height. Other than that, the other tools I use are not exclusive to the Instant Pot, but an immersion blender, potato masher, and good oven mitts will come in handy. If you plan on slow cooking with your Instant Pot, or need a lid to cover the pot for sautéing, they do offer a glass lid that could come in handy for those purposes, but I haven’t used it myself, because I haven’t actually used the slow cooker setting on the Instant Pot yet. If I’ve missed any of your favorite accessories, or there’s something I should know about, please leave a comment below so we can all benefit from each other’s experience. Reader Feedback: If you already own an Instant Pot, what has been your favorite recipe to make in it so far? Looks like it’s worth a shot to me! I am having difficulty finding a 7″cake pan for my instapot. Where did you get yours? Hi! Just wondering what the smallest size instant pot is that you recommend for two people to still be able to do the two different kinds of food cooking you do using the different tools. I like the 6-quart DUO if you want to do all of the pot-in-pot cooking, which is what makes the Instant Pot SO convenient. Hi! what type of bowl do you recommend for IPI? thank you! I use 7-inch porcelain bowls that I’ve had for years from West Elm, but any oven-safe bowl that fits in your instant pot should work! I’ve also used glass storage bowls by Anchor and they have worked well, too. Hi Megan. I was looking at the trivets link on amazon and the listing is showing a diferent measurement than the ones you mentioned here in the article. Now they selling only the 1.2” height. Do yoy think that would work? Or I should keep looking for something a little bit higher like yours? Hi there. Update : these trivets works very well! It has the mitts, the steamer, and the mold. Completely in love with my IP and those accessories. I can make the same egg bites as the ones I pay a lot for at Starbucks (for a lot less haha)! I purchased and pre purchased on amazon your new upcoming book. I can’t wait. I also purchased your suggested supplies. I made your muffins with pineapple and carrots, as I do for my mom and aunt for their freezer 30 at a time. One a day they love them. Anyway I used the silicone cupcake as well as the parchment paper ones and the silicone burned on the bottom of each one. Is there a different way to use these? Such as oven temp or duration of time. I was so disappointed. I can’t wait for your healthy instant pot cookbook! I use mine all the time! I bought a strainer basket for mine with a handle on it and I use it for making my bone broth. I put the chicken bones and all of the other ingredients in the basket, and then easily* lift it all out and it has drastically cut down on the straining step! 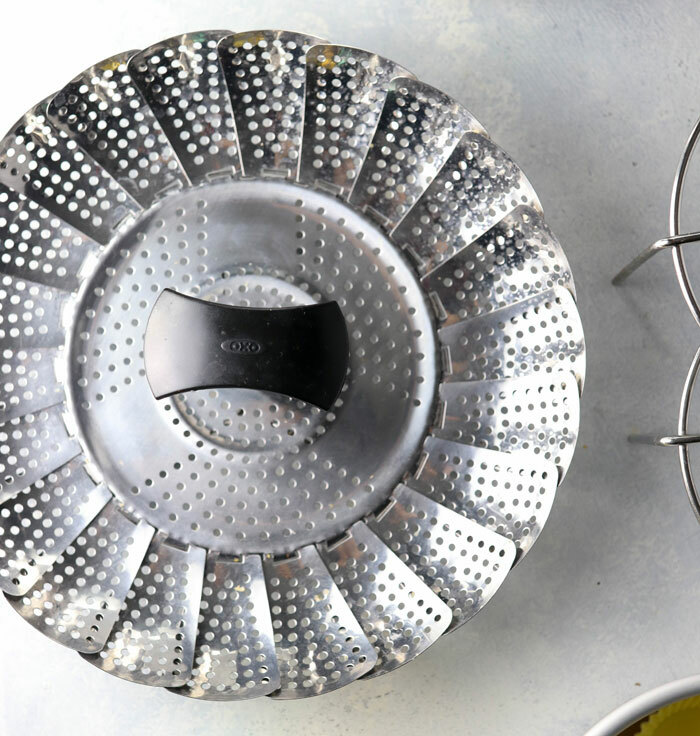 * Note: buy a strainer with a handle that looks like it will stay in the holes meant for the handle (stay attached to the strainer). My handle ends pop out of the holes they slide into when I lift out a heavy amount of food. I love your site. My friends all think I am a genius healthy cook because I get so many ideas from you and make great foods based on your recipes. Thanks for that! !